Andrzej Panufnik would have been 100 this year. On Sunday night the London Symphony Orchestra did his memory proud at the Barbican Centre with a superbly prepared revival of his Tenth and last symphony, conducted by Sir Antonio Pappano. The condition of lateness, a self-conscious refining of language when at work in the shadow of death, often produces in composers an economy if not simplicity of expression. In their different ways Mahler, Sibelius, Shostakovich and Stravinsky all cut away the scrub to leave the new plant standing rude and bare. So does Panufnik. The drive to say more with less must be partly physiological: physical incapacity and exhaustion both draining the composer of energy if not will; partly practical, if they do not wish to leave Schubertian sheaves of unfinished material. 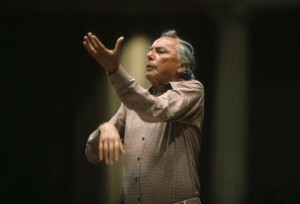 Panufnik, however, had more energy than those cited above, and wrote prolifically in the last five years of his life, not unlike this year’s other anniversary composer, Richard Strauss. Panufnik’s personal accommodation with modernist techniques was always evolving under creative and sometimes political exigencies. His Lullaby (from 1947, two years after Strauss’s Metamorphosen) for 29 strings and 2 harps deals largely in hushed quarter-tones and aching glissandi, while the quaint neo-Baroqueries of the Concerto in modo antico (later derived from film music written in 1951), presently being revived by the Chicago Symphony Orchestra and Riccardo Muti, are hardly recognisable as the work of the same composer. The LSO’s programme note passed gnomically over the four sections of the Tenth: ‘the character of an invocation… meditative in character… prayer-like section’ and so forth. More interesting to me was how Panufnik revisiting characteristic tropes, musical fingerprints, one more time. I heard echoes in the Tenth’s opening fanfares of the Sinfonia Sacra of 1963, which made Panufnik’s name worldwide. The opening hocket of trumpet fanfares offered to many listeners a majesty and emotional power they couldn’t find in much other music of the time. Twenty-five years later, the composer revisits the idiom in a more guarded way, now placing the Maestoso fanfares in cramped duet and in counterpoint with a low, dour trombone melody. A drum-punctuated string recitative launches the following Allegro, and its dramatic character put me in mind of the composer talking about another late work, the Bassoon Concerto, in operatic terms: an aspect of the symphony that emerged strongly in Pappano’s interpretation. The Tenth, and with it Panufnik’s symphonic career, closes with another slow hymn for harp and strings. The harmony aspires to the open, whole-tone confidence of the Sinfonia Sacra, but is now more clouded with dissonance. We’re back in the unquiet nightscape of the Lullaby. It’s all over in a mere quarter of an hour.